The reaction of new members has been matched by the growing indifference of committee and party leaders to the history and independent role of their own institutions and by a widespread acceptance by congressional leaders that the ends justify the means. One small but meaningful example of this is the House Historian. The historian’s office was created in 1983 and was ably filled by historian Ray Smock until January 1995, when he was fired by incoming Speaker Newt Gingrich. Gingrich then moved to appoint Christina Jeffrey, a political scientist from Kennesaw State College in Georgia. Jeffrey lasted a few days — when controversial comments she had made several years earlier caused enough of an outcry that Gingrich fired her. He did not replace her, and the post of House Historian stood vacant for a full decade, with neither Gingrich nor his successor, Speaker Dennis Hastert interested enough to fill the job or energize the office. Finally, in 2005, Hastert appointed the veteran historian and author Robert Remini from his home state of Illinois to fill the position. But the decade-long indifference to the importance of the history of the House underscored the decline in institutional identity in the House. Jeffery was fired by Gingrich after it was revealed she had criticized an educational program on the Holocaust for having “no evidence of balance or objectivity.” “The Nazi point of view, however unpopular, is still a point of view and it is not presented; nor is that of the Ku Klux Klan,” said Jeffrey. Forget the Holocaust-related controversy; the fact is that, even if she had never uttered or written one outrageous or controversial thing, she was wholly unqualified for the position. She is neither a historian nor a Congressionalist. Indeed, she made it quite clear from the beginning that she knew little at all about the House in its contemporary operation, much less anything about its history. Ray Smock, the first House Historian, is a solid, credentialed, thoroughly competent professional. It was the prerogative of the new majority to redefine his position, replace him, or both; it was their prerogative, if they desired, to eliminate the post. Concerted efforts to improve the historic preservation of the House only got underway after Gingrich resigned from office, culminating in the the naming of Remini as Historian of the House in 2005. Since then, the commitment to the history of the House has been bipartisan, with the offices of Nancy Pelosi and John Boehner working together in 2010 to find Remini’s replacement, Dr. Matthew Wasniewski. The Historian’s Office was first created to prepare for Congress’s bicentennial, which occurred in 1989. Though Gingrich’s bill would have let the office expire that year, House Democrats drafted a rules change that made the House Historian a permanent post under the control of the Speaker. 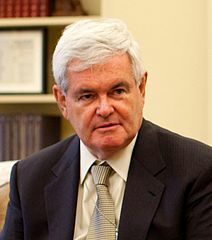 In 1982, after the House defeated a Gingrich proposal that would have established a permanent historical office, Gingrich delivered a speech extolling the virtues of preserving the chamber’s records. This entry was posted in Uncategorized and tagged Congress, History, House of Representatives, Newt Gingrich, Politics. Bookmark the permalink. For a perspective on this whole affair that is written from a family member’s point of view, I encourage you to look at the opinion section of http://www.newsherald.com in which I describe the events briefly. Payback is heck, when Mr Price reveals the true chacter of Newt…Newt is a confirmed liar and Coward when it comes to America..